Performers include: Clayne Crawford, Damon Wayans, Kevin Rahm, Keesha Sharp, Dante Brown, Chandler Kinney, Jordana Brewster, and Johnathan Fernandez. This action drama series reimagines the movie franchise and follows a cop duo as they work a crime-ridden beat in modern-day Los Angeles. 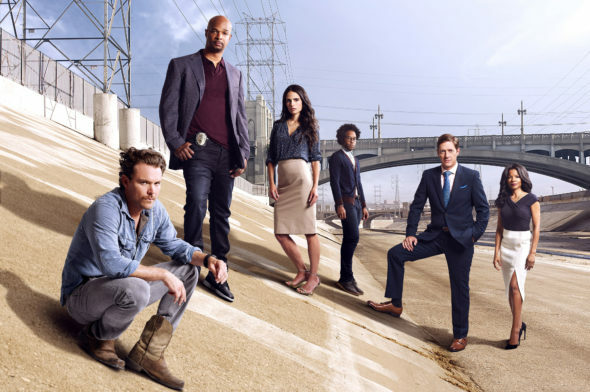 Grief-stricken after the loss of his young wife and unborn child, ex-Navy SEAL-turned-detective Martin Riggs (Clayne Crawford) moves to California to “start over” at the LAPD. He’s paired up with Roger Murtaugh (Damon Wayans). He’s just coming back to the job after a near-fatal heart attack. Riggs’ penchant for diving headfirst into the line of fire immediately clashes with Murtaugh’s prudent, by-the-book technique. When Captain Brooks Avery (Kevin Rahm) assigns them to their first case together, Riggs drags Murtaugh into a high-speed chase culminating inside the Long Beach Grand Prix and a seaport shootout with drug dealers. Despite his protests, the older cop feels more alive than he has in years. Meanwhile, Riggs gets a glimpse of why Murtaugh is so determined to get home safely at the end of each day — he’s got a wife, Trish (Keesha Sharp), teenagers Roger Junior (Dante Brown) and Riana (Chandler Kinney), and a newborn baby. Riggs’ life-on-the-edge attitude makes him a priority case for the department’s psychologist, Doctor Maureen “Mo” Cahill (Jordana Brewster). Rounding out the precinct is Scorsese (Johnathan Fernandez), a pathologist with the LAPD who got his nickname after a stint in film school (which no one will let him forget). By the time their first investigation ends, Riggs realizes he may have found something worth living for — a partner and friend, Murtaugh. And even Murtaugh figures this arrangement might just work out after all. If only Riggs doesn’t get them killed first. What do you think? Do you like the Lethal Weapon TV show? Do you think it should be cancelled or renewed for another season? Please renew, my husband and I love this show. Give people time to come back. SWS is an awesome replacement. Please do not cancel this show! I LOVE the new reboot, the chemistry, the great writing and acting. Maggie Lawson is amazing as the ex wife of Cole. WONT WATCH IT BECAUSE —CRAWFORD GONE! There’s always somebody that cant get along with people—but this guy WAS THE BEST, AND THATS WHY I LOOK FORWARD WATCHING IT! I was a fan of Crawford until I saw his berating and swearing at children on U tube. I am glad they let such an abusive person go. Please do not cancel this show!!!!! We love it! It has humor, action, and values. Please keep it! I was skeptical but now that I have watched a few episodes it is as if Sean William Scott has always been there!! Please renew it’s awesome to see him back in action. Great chemistry will Murtaugh!! I like lethal weapon a lot better with Sean William scott!!!! Its always something about the underdog, There C+3 rating are great! Its the supporting Cast! the writing is awesome. 4th season in the bag! Oversea market is ready and primed, this show can’t be stop!